Mini liquor bottles are already cute, but they're even cuter when they feature your own personal details on your choice of label! These personalized mini liquor labels can be customized with your name, birth date or saying on your choice of two labels - black with gold border, or kraft with black textured border. 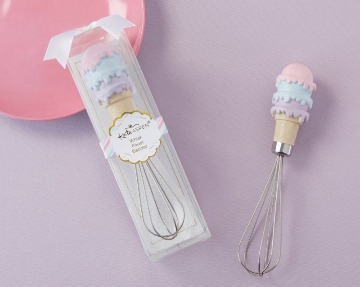 A kitchen staple turns gift-ready with this delectably adorable Ice Cream Whisk favor. Ideal for a stock the kitchen bridal shower or, these favors feature a small silver whisk topped by three scoops of ice cream in pink, turquoise and purple—perfect to add a dash of color and sweetness to your celebration. 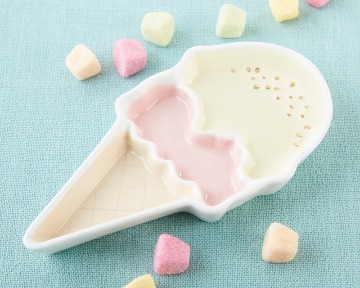 Guests will love the two scoops of fun delivered by this Ice Cream Trinket Dish! A sweet twist on a classic bridal shower favor, the jewelry dish, shaped like ice cream cone, is perfect as a favor or to brighten up your table décor. Bridal showers are sweeter with delectable, delicious cake! With these Cake Slice Favor Box, guests can enjoy cake twice for your celebration. 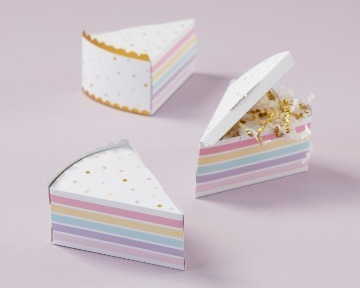 These unique favor boxes feature a colorful layered cake design and can be filled with sweet treats or other small favors. 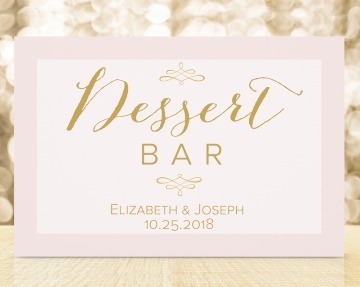 So sweet they’ll melt guests’ hearts! 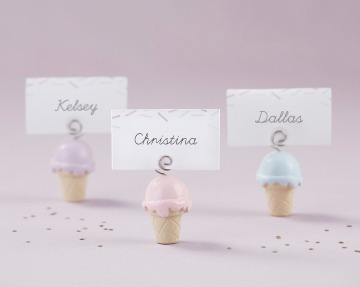 Available in sets of 6, these Ice Cream Place Card Holders are the perfect addition to your bridal shower table decor—featuring a triple scoop ice cream cone shape topped with a place card accented by colorful “sprinkles.” Deliciously adorable! these So Sweet Personalized Mason Jar glasses are perfect vintage-inspired pieces that add a little flair to your bridal shower or birthday party. The unique glassware is perfect for serving signature drinks. They can also be filled with treats for guests to take home or filled with confetti for table décor. Choose your favorite design—the multi-colored sprinkle or pastel rainbow design—to accent your décor and enjoy the functionality. For any bridal shower or birthday celebration, no guest will be able to resist the adorable sweetness of these Ice Cream Favor Boxes. 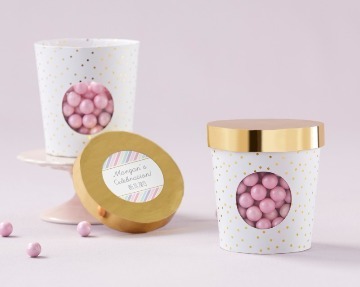 Available in sets of 12, these unique favor containers—shaped like ice cream pints—are as much of a treat as those they hold! 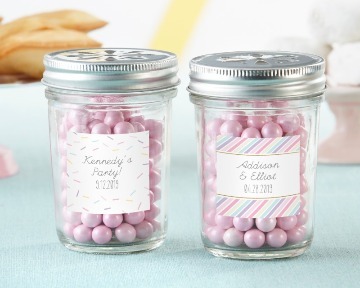 Each favor container can be personalized with a custom sticker to include your event details! 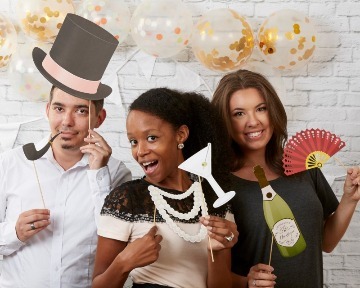 Whether it's a wedding, bridal shower or engagement party, this celebration is a time to gather and be grateful. This two-piece set features a bamboo mason jar-shaped cheeseboard and coordinating bamboo spreader, perfect for guests to sample meats, cheeses and other bite-size appetizers, and a favor that they are sure to use time and again. Pop the top on a great celebration with thisMason Jar Bottle Opener favor. 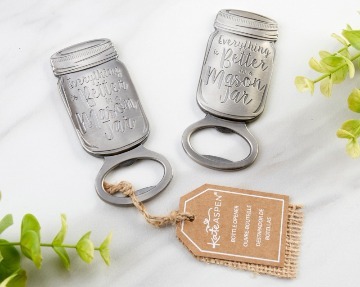 Whether it’s a wedding, bridal shower or even birthday party, add a little rustic charm and farmhouse-inspired style to any event with these antique silver mason jars bottle openers that have “Everything Is a Better in a Mason Jar” engraved on them. 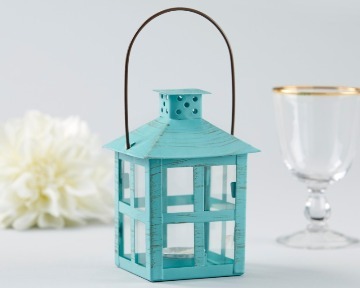 As favors, as part of centerpieces, or as a means of lighting your walk down the aisle, this Vintage Blue Distressed Lantern is guaranteed to bring rustic romance to your big day. The Seaside blue paint has a distressed finish giving the lantern a vintage appeal, while the four glass walled panels around the lantern beautifully toss the light of the included tea light candle. In a medium size, the Vintage Blue Distressed Lantern is versatile decor that can be worked into your event in many different ways! 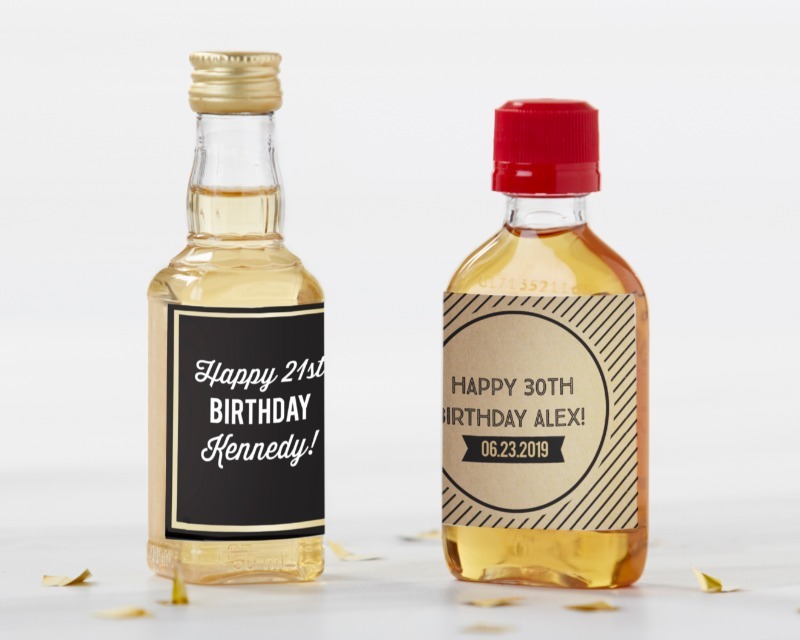 If you're looking for a great party favor to celebrate with after your boozie birthday party, look no further than these Personalized Bottle Stopper with Epoxy Domes. This golden bottle stopper favor can be personalized with a custom saying or your own special details. The search is over for great glassware favors that are fun, functional and even beautiful! This personalized 9 oz. 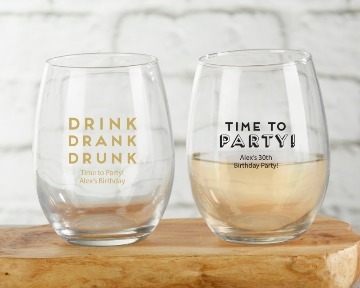 Stemless Wine Glass can be printed with your own special details like your name and birth date. Pick your favorite design and fill with your favorite beverage, and you'll be set! There's nothing like a reusable drink sleeve, especially when it's printed with a fun saying like "Drink Drank Drunk"! 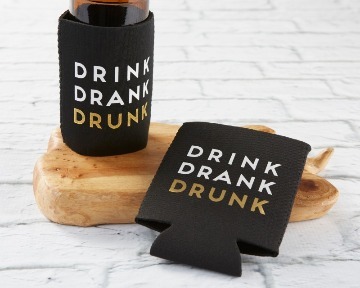 This fun Insulated Drink Sleeve Set is great for keeping drinks cold whether you're having a bachelor or bachelorette party or celebrating your birthday! 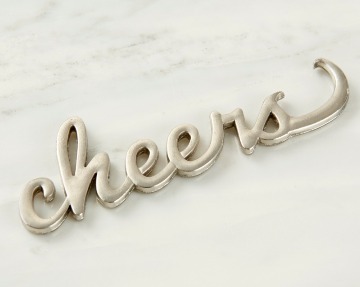 Toast to celebration with this Cheers Silver Bottle Opener! This silver bottle opener favor is the perfect bridal party gift to thank those who are standing beside you on your big day, whether alone or with your favorite bottles. The bottle opener is made from brushed silver metal and spells out the word "cheers" in a script font. These Personalized Matchboxes use Modern Romance sticker designs to turn ordinary matchboxes into personalized wedding favors! 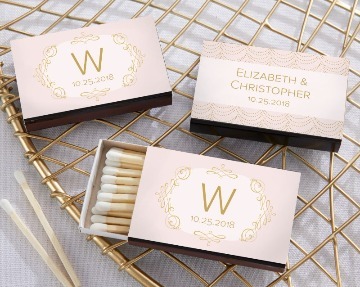 Each matchbox includes around 20 match sticks, and are sold in sets of 50, so these wedding souvenirs are suited for weddings of all sizes. The Personalized Modern Romance themed Matchboxes can be given to guests alone, or along with candle favors! 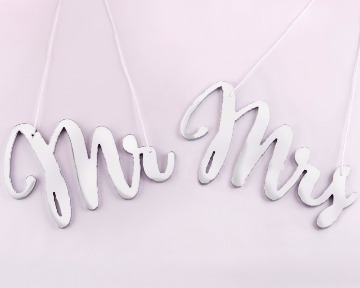 With our personalized wedding sign, you can decorate the halls of your venue while you celebrate. Direct guests to your dessert table, so that they can enjoy all of the delicious treats! This Personalized Gold Bottle Opener features a personalized Modern Romance theme on a wedding favor your guests will love. 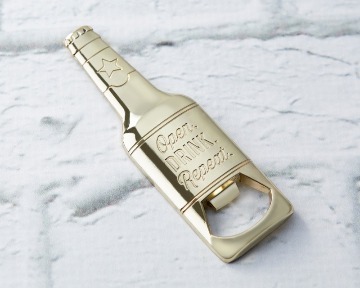 The Modern Romance design complemented by the shining gold finish creates personalized bottle opener favors that are useful while still making a big impression. 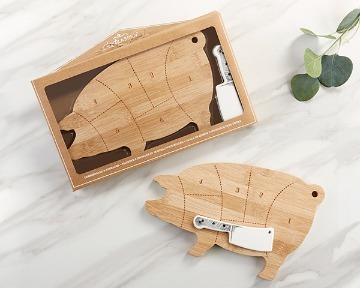 Give guests a gift that they can use to remember your special day forever! These Gold Double Heart Place Card Holders, available in sets of 6, help guests find their seats with simple elegance. Each set features two gold hearts displaying place cards with a delicate gold wave pattern. 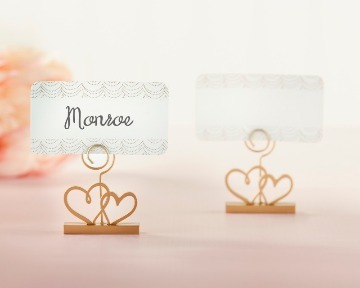 These place card holders are perfect wedding or bridal shower table décor. For your wedding, choose beautiful table décor that is also functional! 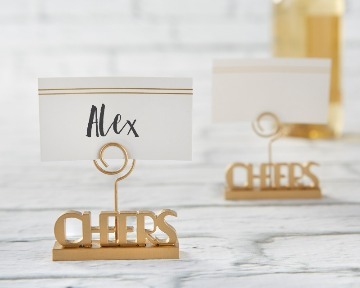 These cheers to You Gold Place Card Holders help display seat assignments in style. The cards come with coordinating rectangular cards that feature a striking gold design. Gold looks good at any special occasion, especially a wedding, bridal shower or birthday! 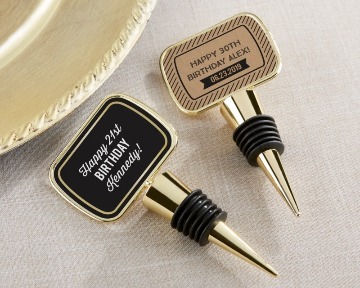 This Cheers to You Gold Bottle Stopper keeps open wine fresh at your celebration and makes an elegant favor guests will be delighted to take home! 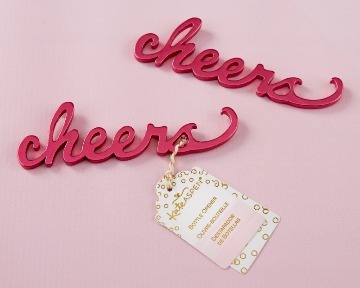 Say cheers to a new marriage, new baby or new engagement with Kate Aspen’s Cheers Pink Bottle Opener. 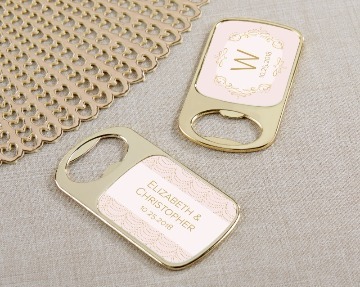 The bottle opener is great to include in a bridesmaid box or to use as a bridal shower game prize. 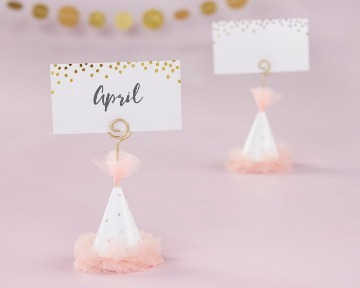 Get into the party mood before your big bachelorette night out with a set of 6 Kate Aspen Pink Party Hat Place Card Holders! Not only for bachelorette parties, these work beautifully in leading guests to their seats at bridal showers and birthday parties as well! 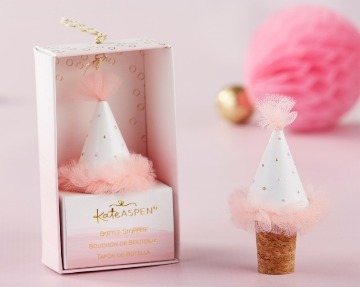 Make those bachelorette party and bridal shower favors even more festive with Kate Aspen's Pink Party Hat Bottle Stopper favors! The bottle stopper can be used with wine favors, but also make a great impression on their own! 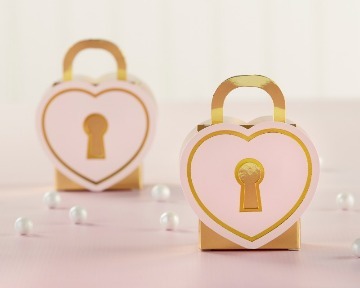 Each favor box features a heart-shaped padlock design with pink and gold accents to keep favors safe and sound while guests enjoy your bridal shower or wedding. These favor boxes add a whimsical touch to your wedding dar décor. 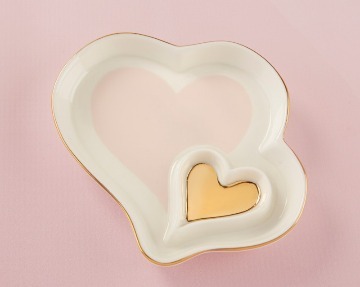 Our Double Heart Trinket Dish favor is the perfect way to spread the love at your wedding or bridal shower. Perfect for celebration attendees or as bridesmaid gifts, the heart-shaped ring dish features two hearts—a larger pink heart connected to a smaller gold heart— and is perfect for holding jewelry, loose change, keys or other small items. 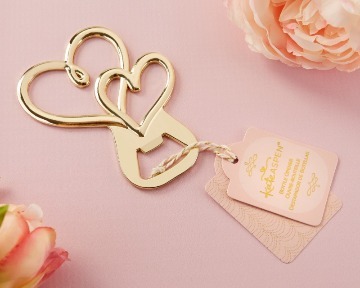 Bring a little love to every guest with Kate Aspen’s Gold Double Heart Bottle Opener. Featuring a two interlocking gold-toned hearts, these bottle opener favors are perfect for popping the top on guests’ favorite beverages and celebrating the union of two hearts. 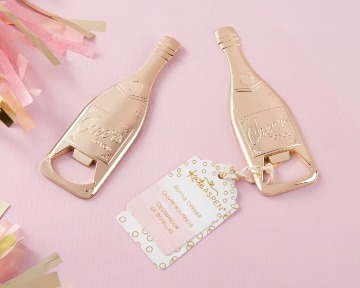 Kate Aspen's Gold Champagne Shaped Bottle Opener favors are made from gleaming gold-toned metal that spells out "cheers to you" on the front of each piece. This favor is just the gift to celebrate your bachelorette party in style! Kate Aspen's Pink Champagne Favor Boxes are perfect for weddings, showers, and bachelorette parties of all sizes! 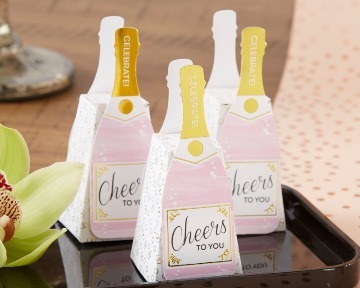 The favor boxes feature a champagne bottle applique on front, with pink bubbles, and "Cheers to You!". Set a festive mood at your bachelor or bachelorette party with Kate Aspen's beer shaped bottle openers. With "Open. Drink. Repeat." 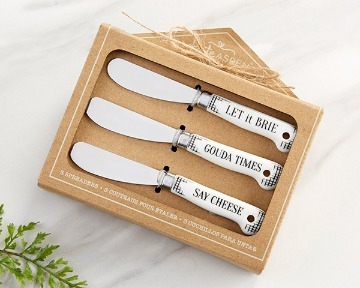 printed on the metal bottle openers, these unique favors scream, "Let's get the party started!" You're about to ask one of the most important questions you'll ever ask of your girlfriends, so why not make it extra memorable? Kate Aspen's Will You Be My Bridesmaid Pink Heart. 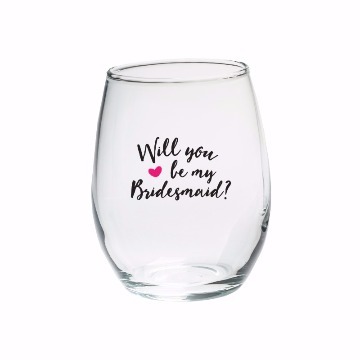 Stemless Wine Glass is the perfect asking gift for your bridesmaids! 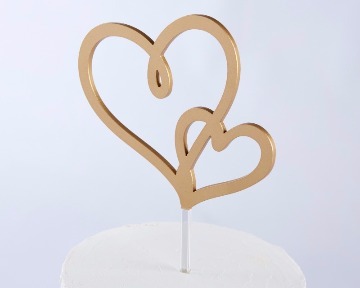 Kate Aspen's Gold Double Heart Cake Topper is an elegant representation of the union of two hearts. 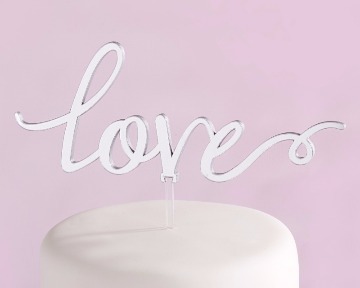 This cake topper is perfect to add to the top of your wedding cake! 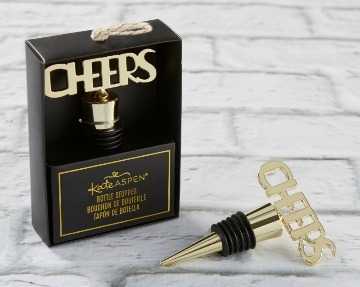 Kate Aspen's Cheers to You Gold Bottle Stopper keeps open wine fresh at your celebration and makes an elegant favor guests will be delighted to take home after your wedding or shower! 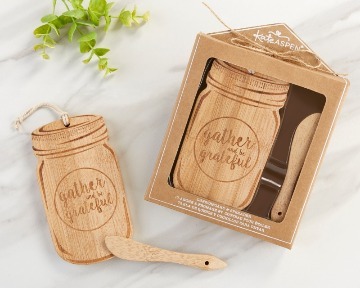 This two-piece set features a bamboo mason jar-shaped cheeseboard and coordinating bamboo spreader, perfect for guests to sample meats, cheeses and other bite-size appetizers, and a favor that they are sure to use time and again. 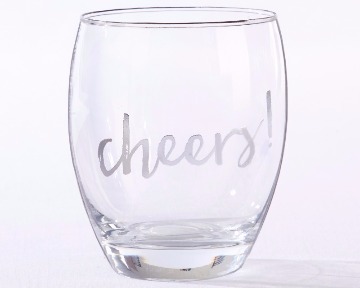 🍷 Keep the feeling of celebration going at your wedding with these Silver Cheers! 12 oz. Stemless Wine Glasses! 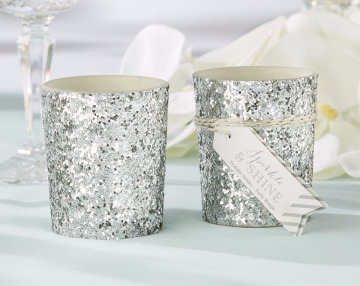 Sparkly silver glitter is the perfect complement to decor at your winter bridal shower or engagement party. 🕯️ When paired with a long tapered candle, these candlesticks bring a touch of soft elegance to any winter wedding or event table! 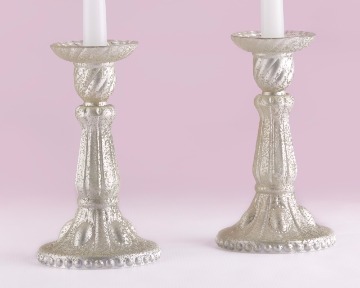 🕯️ Your reception tables will shine with an enchanting, silvery winter glow with these sparkling silver votive candle holder! These Silver Confetti 12 oz. 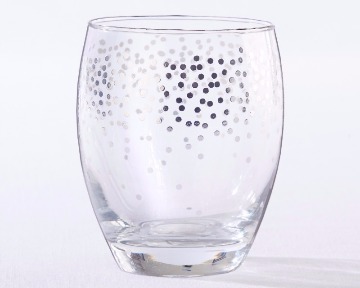 Stemless Wine Glasses are just the celebratory addition your wedding has been looking for! 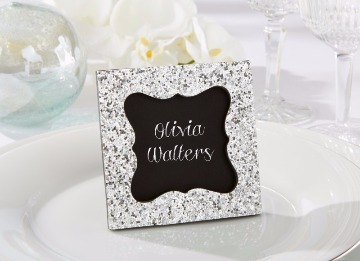 This glittery, eye-catching photo frame/place card holder is a must-have at your winter wonderland wedding! ❄️ More than just a place card holder and ornament that shines with style, this delicately designed snowflake with classic black ribbon is also a keepsake magnet and photo frame! 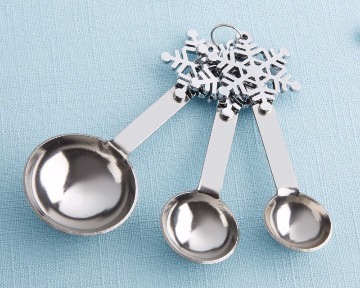 These winter measuring spoons feature a silver metal snowflake decorative accent on the handle of each spoon and come with three spoons per set. Perfect as winter wedding favors, or stocking stuffers! 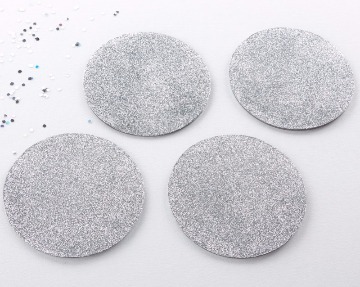 If silver is part of your color scheme, these are the coasters to tie your tables right in to your theme! 💍 This Silver Mirror Love Cake Topper brings the love to weddings or bridal showers of all themes! 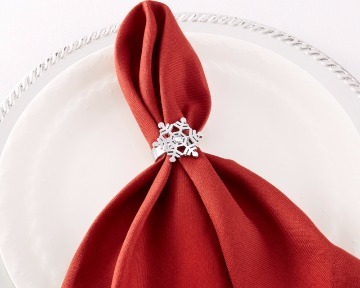 Bring a touch of the North Pole to the decor at your holiday-themed wedding or bridal shower with Sparkling Snowflake Napkin Rings! 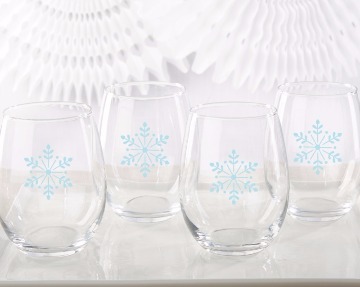 ❄ Perfect for winter weddings or holiday parties, these stemless wine glass favors come in sets of 4 and feature a beautiful light blue snowflake design. 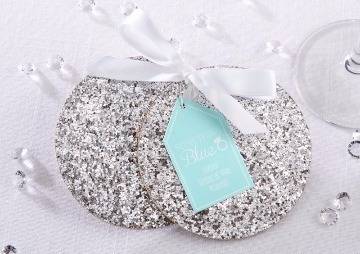 Mark your spot at the reception with these Silver Mirror Mr. and Mrs. Chair Signs! 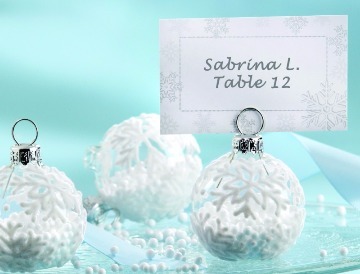 This "Snow Flurry" Holiday Ornament Place Card/Photo Holders will delight your guests with the spirit and beauty of the winter season!